What are the requirements for becoming a California licensed contractor? California Law requires all businesses or individuals who construct or alter any building, highway, road, parking facility, railroad, excavation, or other structure in California must be licensed by the California Contractors State License Board (CSLB) if the total cost (labor and materials) of one or more contracts on the project is $500 or more. You do not have to reside in California to obtain or keep a contractor’s license. Contractors, including subcontractors, specialty contractors, and persons engaged in the business of home improvement must be licensed before submitting bids. You must have at least 4 years of experience to qualify to take the examination. However, you may receive credit for your technical training, apprenticeship training or education instead of a portion of the required 4 years of practical experience. There are serious penalties for unlicensed contracting without a license. First-time offenses are usually a misdemeanor, carrying a potential sentence of up to six months in jail and/or a $500 fine, along with a potential administrative fine of $200 to $15,000. The penalties go up with subsequent violations. How do I get my contractor license in California? You must have more than $2,500 worth of operating capital. Operating capital is defined as your current assets minus your current liabilities. After your application is processed and found acceptable, you will be sent a Notice to Appear for Examination which will include the date, time and location of the exam. Examination sites are located throughout the state. All qualifying individuals must pass the standard Law and Business examination in addition to a second test covering the specific trade or certification area for which they are applying. Both exams consist of multiple choice questions. Contractors who work with asbestos or other hazardous substances are subject to a number of certification, registration, reporting, and safety requirements and require additional training, exams and applications to become certified.You must have at least 4 years of experience to qualify to take the examination. Credit for experience is given only for experience at a journey level or as a foreman, supervising employee, contractor, or owner-builder (one who has the knowledge and skills of a journeyman and who performs work on his or her own property). There are no education requirements to qualify for a contractor’s license. However, you may receive credit for your technical training, apprenticeship training or education instead of a portion of the required 4 years of practical experience. At least one year must be practical experience. Check state web site for details. Are Exam Prep Courses available to help me prepare? California Exam Prep Courses are available online to help you prepare for this exam. Builders License Training Institute is one exam prep course provider. 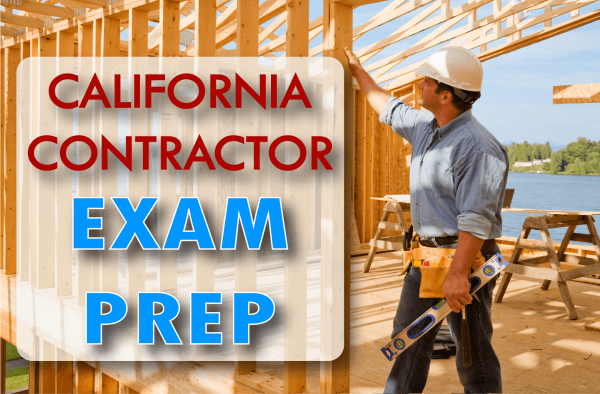 You will be able to prepare for the California Building Contractor License Exam on your own schedule with their mobile-friendly Contractor License Complete Course Package that covers both the Law & Business Management and General Building (B) portions of the exam and is based on the 2016 California Building Codes. This entry was posted in Construction and tagged CALIFORNIA BUILDER, california Contractor.